Student Government Executive Alliance candidates Braydon Jones, second from left, and Kimia Dargahi, far left, will compete against fellow candidates and Texas Travesty editors Xavier Rotnofsky, second from right, and Rohit Mandalapu, far right, in a runoff election next week as neither alliance received over 50 percent of the vote. After a University-wide Student Government election in which no executive alliance ticket captured over 50 percent of the vote, candidates Braydon Jones and Kimia Dargahi will enter a runoff election against Xavier Rotnofsky and Rohit Mandalapu. The Jones-Dargahi alliance received 46.34 percent of the student vote, and Rotnofsky-Mandalapu received 26.9 percent. 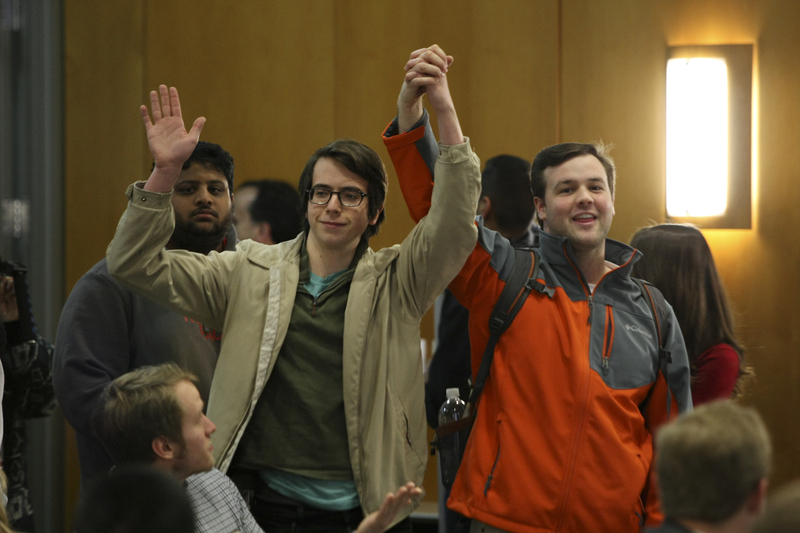 The other two executive alliances on the ballot, David Maly and Steven Svatek and Baylor Morrison and Matthew Normyle, received a combined total of 26.74 percent. The Texas Travesty, a humor publication, enters a team in SG elections each year. Jones, who has described himself as the candidate with the most Student Government experience, said he is optimistic about his team’s odds for the runoff election. Nicholas Molina, Election Supervisory Board chair, said it was difficult to predict the results of the Executive Alliance race in advance. According to Molina, 9,108 votes were cast in the election, an increase of 14 percent in voter turnout over last spring. Arjun Mocherla, an agent on Jones and Dargahi’s campaign, said the run-off will allow more time to get student input for their platform. Texas Travesty editor-in-chief Chris Gilman said he attributes Rotnofsky and Mandalapu’s success to reaching out to smaller and more diverse groups of students. Maly-Svatek received 1,161 votes, and Morrison-Normyle received 1,009. Morrison-Normyle said Sunday they were going to withdraw from the race, but, according to Molina, the duo never officially removed themselves from the ballot. Jones said Morrison-Normyle being on the ticket may have impacted the results. “With Baylor and Matthew withdrawing and still being on the ballot, some people may have gotten confused and messed up the numbers,” Jones said. Morrison said he does not think having his and Normyle’s name on the ballot affected the outcome of the election and said that he was pleased with the results. Maly congratulated the runoff teams and said he enjoyed campaigning for the election. “It was an interesting race and a good learning experience,” Maly said. Jones-Dargahi and Rotnofsky-Mandalapu will be allowed to spend an additional $150 each on campaigning. The two teams will compete in the runoff election March 11–12.